Where Do Nurse Entrepreneurs Work? What Is a Nurse Entrepreneur? Nurse entrepreneurs use their professional nursing experience and education to start their own business in the healthcare industry. Businesses established by nurse entrepreneurs may include developing and selling a home health product or medical device, or offering independent nursing services, such as patient care, nursing education, home health and/or consulting services. 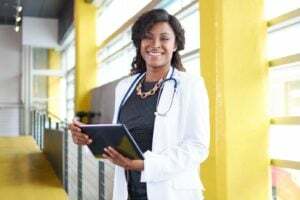 A nursing career path that offers independence and autonomy, becoming a nurse entrepreneur requires creativity, hard work and strong business skills. As in other nursing careers, aspiring nurse entrepreneurs begin their careers by completing their Associate's Degree in Nursing or Bachelor of Science in Nursing degree and pass the NCLEX-RN exam. In addition to the standard nursing education, nurse entrepreneurs benefit significantly from learning important business skills such as marketing, accounting and managerial techniques. Then an aspiring nurse entrepreneur often begins work as a professional nurse in order to learn the industry and discover business opportunities within it. While an advanced degree is not required for nurse entrepreneurs to start their own business, many nurses may consider a dual master's degree program in nursing and business administration, in which students complete their Master's of Science in Nursing and Master of Business Administration degrees simultaneously. Learn more about an MSN in Executive Nurse Leadership. What Are the Education Requirements for a Nurse Entrepreneur? In general, nurse entrepreneurs have completed a minimum of the ADN or BSN degree and have attained an RN license in the state in which they live. A background in business is also highly valuable for nurses who wish to start their own businesses. This may include informal training or mentoring in business skills, taking a few courses in business, or attaining a business degree. Many nursing schools across the country offer dual programs which deliver MSN and MBA degrees simultaneously. There are no specific certifications or credentials required for becoming a nurse entrepreneur. However, a nurse entrepreneur may find certain certifications valuable based on the nature of their business. For instance, a nurse who runs a home health company and provides patient care may wish to hold the Basic Life Support Certification (BLS) from the American Heart Association or American Red Cross. Nurse entrepreneurs may work in a variety of settings, including in offices running their own business, as an independent nurse contractor in hospitals or clinics, in home healthcare visiting patients, or as a nurse educator. Nurse entrepreneurs have the freedom to set their own hours and the flexibility to determine their own work environments based on the company they establish. A nurse entrepreneur uses his or her background in professional nursing to start their own business within the healthcare industry. Business ventures established by registered nurses run the gamut from medical devices and home health products to independent nursing services such as patient care, nursing education, home health services and consulting work. The day-to-day responsibilities of a nurse entrepreneur depends upon the specific venture, but usually includes activities related to running a business including accounting, marketing or sales, and developing a customer base. What Are the Roles and Duties of a Nurse Entrepreneur? An increasing number of nurses are enjoying the benefits of self-employment. While salary can vary widely based on the specifics of their business ventures, many nurse entrepreneurs are also independent nurse contractors who set the terms of their own services and negotiate their salary with a healthcare facility, such as a hospital or nursing home. While not as certain as traditional employment, a career as a nurse entrepreneur can be more profitable than a standard RN position.